However, as convenient as outdoor faucets are, they can also create hassles that need to be resolved by a plumber. Tackling outdoor faucet repair problems quickly should make life easier. Outdoor faucets commonly leak, causing households to unintentionally waste water. It’s most likely for leaks to originate from the handle or spout. Furthermore, the location of the leak dictates the steps to follow for proper outdoor faucet repair. Professional plumbers can assess the issue and determine how to fix it. Sometimes, leaks are not very severe, so people don’t immediately notice dripping water, but see pooled liquid below the faucet. You may also find although you were able to get a steady flow of water from your faucet yesterday, the liquid has slowed to just a trickle today. Even worse, if the water pressure inside the house is great, the problem becomes more perplexing for householders to diagnose. The issue may be happening because there’s a piece of debris blocking the faucet’s opening and interfering with the water’s movement. 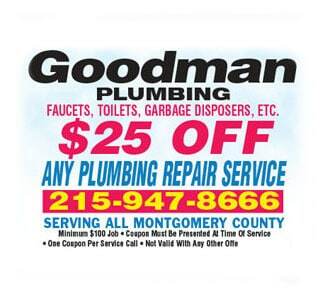 If you’re not comfortable taking the faucet apart and investigating further, it’s best to consult a plumber like Goodman Plumbing. Keep in mind, faucets often have small parts that could easily get lost in grassy areas, so if you do choose try outdoor faucet repair without a plumber, get a bowl or similar container and use it to keep screws, washers and other small pieces nearby and in a single place while you work. Faucet parts are prone to rust due to moisture exposure. Furthermore, some parts become so corroded or worn they no longer function as they should. If you believe a faulty component is causing your faucet issues, it’s a good idea to call a plumber for service. 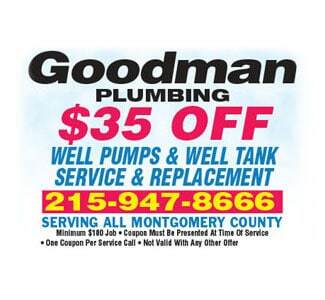 At Goodman Plumbing we have access to the parts you need, plus we can install them correctly, which reduces the likelihood of future issues. Additionally, we should be able to quickly assess which part is malfunctioning, so you can avoid trying to engage in do-it-yourself repairs and potentially buy the wrong piece to fix the problem. When outdoor faucets work well, they usually make life more convenient. Be sure to promptly attend to any outdoor faucet repair matters you notice so they don’t get worse. 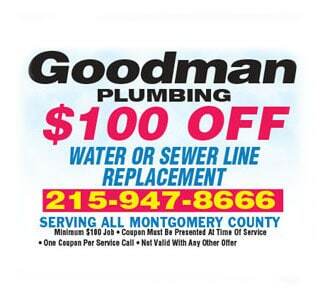 Goodman Plumbing offers emergency plumbing repair for all of your plumbing needs.